We’re not talking about what colour hair they have or how tall they are, we’re talking about their shopping habits. As you can imagine, there’s no fixed criteria that a shopper has to meet in order to be deemed a Black Friday shopper—as even if you have a large portion of customers that have never shopped with you on this day/weekend before, it’s dangerous to outrule them as they might engage this year. That said, it’s still definitely worth looking at your customer base’s historic data (behavioural and purchase) to glean whatever you can about the different types of Black Friday shoppers you have had until now. This could be shoppers who only ever shop with you on this weekend (and ignore your brand for the rest of the year) or loyal shoppers that engage on a consistent basis, including Black Friday. Once you know what your Black Friday shoppers tend to look like, the next question is how to market to them. This is what we explore in the next section: "What?" When it comes to marketing to your Black Friday shoppers, there’s no hard-and-fast rule as, as mentioned above, there are different types and each type will respond better or worse to different marketing messages. Segment one: Only ever shop with you on Black Friday, and have done so for the past [x] amount of years. Segment two: Shopped with you for the first time last Black Friday, but haven’t shopped with you again since. Segment three: Loyal shoppers who consistently shop and/or interact with your brand, including Black Friday. When talking to a one-off Black Friday shopper (segment two), you may want to focus purely on the big discounts you're offering and structure your email in a succinct way that gets straight to the point, whereas with your more loyal shoppers (segment three), you’ll be talking to recipients that are a lot more familiar with your brand, and therefore may want to be that bit more chatty and include any intertextual content they’ll understand. As well as adjusting the tone of voice and copy of your Black Friday email according to the stage in which each shopper is currently at in their journey with your brand, you can also market to them in a way that is personalised on a more 1:1 level. This is something we explore in the next two points. Completely personalised recommendations will be based on information such as a customer's: likes and dislikes, purchase history (which can, for example, ensure no items purchased fully price are suggested) and any details offered during the signup process. In order to run a fully personalised engine such as this, you need a certain amount of customer data—preferably brought together and stored in one, central place. That said, the danger with this is that dynamic product recommendations may render products you don’t want to promote for Black Friday. You can prevent this from happening by filtering your product recommendation engine by a specific category or attribute. (This just means you can limit your recommendations to a specific product, category or brand, and likewise you can blacklist certain products you don’t want to appear). For subscribers that haven’t interacted with your brand yet (nor have they offered any information about themselves during the signup process) you can use a more generic engine (such as “top products”), but still filter it by what you want to promote the most for the day/weekend. As well as your main Black Friday mail-out, also think about what your automated emails will look like and what they will include ahead of 24th November. For example, take browse and cart abandonment emails. As highlighted in the infographic at the top of this post, last year the proportion of visits to retailers’ sites resulting in abandoned carts was 87 per cent higher than it is for the rest of the year. Consequently, it’s worth optimising these types of automated emails for the Black Friday weekend - reminding recipients of the deals in place and getting them excited about what’s on offer, as well creating a sense of urgency to snap deals up before they're over. Our customers are a case in point. 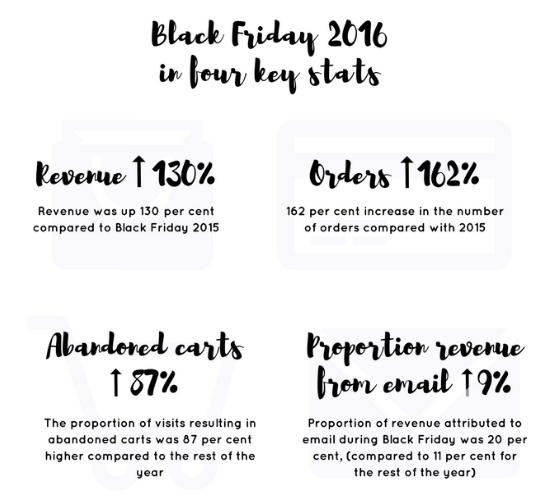 Last year, those that implemented tailor-made cart and browse abandonment campaigns for the Black Friday weekend experienced, on average, a 240 per cent increase in revenue from these types of emails compared to a normal four day period. Welcome email: Update your welcome email for the week leading up to Black Friday to tell people about the offers you'll be having. Post purchase email: Cross-promote products based on the item/s purchased, reminding customers which ones will be included in the Black Friday sale. Win-back emails: Re-engage at-risk or lapsed customers by reminding them of the amazing Black Friday deals you'll be offering on your site in the coming weeks. Birthday email: If you send birthday emails, make sure those sent during the Black Friday period acknowledge that any special discount or deals you're offering them can be used on top of Black Friday deals (if this is something you offer). This analysis will give you a feel for the products and categories likely to do well this year, and help you determine the most effective copy, CTAs, links or images to use in this year’s email campaigns - as well as the best time to send them. But more on send-time and deliverability below. Like a closely monitored GCSE exam, Black Friday is all about adrenaline-inducing deadlines. You are the invigilator, reminding your shoppers how much time they have to submit their orders. From scheduled send time of your email (e.g. midnight on 24th) to send time optimisation (i.e. where an algorithm detects the best time to send a campaign) to dynamic countdowns, remember to take into consideration the different timezones for all of your recipients. After-all, you don’t want to be emailing somebody in Paris letting them know they have an hour left to make their purchase, when they actually have zero time left and have already missed the boat. Merde. The campaign has been sent...now for getting it delivered and read. As most of us already know, there are certain words, characters or combinations of both words and characters that internet service providers despise and outright reject. As you can imagine, all of the above are extremely alluring for an email marketer wanting to share all of its brand’s amazing deals - but it’s worth being discerning and toning your message down if it means getting it read. Crashing the system: Don’t send everything at once as it might crash your site. It’s better to throttle sends. Managing bounce rates: One way to optimise the number of recipients that actually receive and open your email (which in-turn improves your deliverability) is to send to your very best, most loyal customers first. Why? Because they are more likely to result in a high open-rate (which is great for improving deliverability). Create a high-spend/VIP customer segment and reach out to them before anyone else. Not only are they more likely to engage, but they are also likely to spend the most—so giving them the go-ahead first to make sure they can bag what they want is also likely to result in high revenue. We'll finish off with a last minute tip on customer retention ahead of 24th November. Thank any first-time customers for shopping with you and encourage them to come back. Even if a transactional email is your only means of communication (e.g. purchase receipt), you can add a bit about your brand and/or show a bit of personality via your copy. On the back of the point above: make it easy for brand new visitors/customers to your site to sign up to your marketing messages/newsletter. You can do this by a newsletter popup, or by including the option to opt-in to your marketing at the checkout (that said, ahead of GDPR, remember to be specific about how you’ll use their data should they signup).